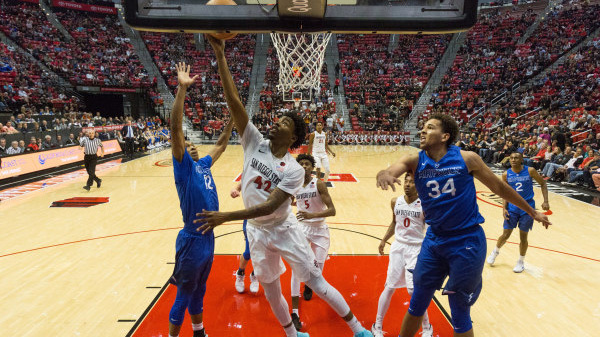 The San Diego State men’s basketball team did something it typically doesn’t do in the 81-50 win against Air Force on Saturday at Viejas Arena, it played zone. The Aztecs (13-8; 5-5 Mountain West) did some zone play against Fresno State, which was successful in the first half but broke down in the second half. That was partly the reason why Dutcher wanted to concentrate on zone this week. SDSU also started more freshmen in a conference game than it has in eight years. Malik Pope was the only starting senior as Trey Kell is out because of a sprained ankle. Sophomore Nolan Narain was also out with shoulder problems, leaving the Aztecs with eight men. Freshmen Jalen McDaniels and Matt Mitchell got the start this week. McDaniels scored 16 points and had 13 rebounds with 7-of-10 shooting to help the Aztecs beat Air Force (8-13; 2-7 MW) for the 13th straight times. Jeremy Hemsley, who filled in for Kell, scored 16 points. Max Montana and Devin Watson also scored in the double digits with 13 points each. Successive treys from Mitchell, Hemsley and Watson early in the first half gave SDSU a 13-7 cushion and opened the game up. The Aztecs were never threatened in the game. Up next, SDSU is on the road against Fresno State on Tuesday. « Does a Movie Need to Have an Original Plot to Be Good?